Are you looking for a good way to slow down and actually see the coral, fish, and other natural wonders that Florida’s waterways have to offer? Jet skis are a great way to take in a lot of area in a day, but it’s easy to miss the details as the scenery whizzes past. Instead, unleash your inner explorer or naturalist — try kayak rentals to explore all that South Florida has to offer. Certain movies have done a lot to show the appeal of coral reefs. They’re a visual feast full of vibrant colors, strange and beautiful underwater plant life, and a huge variety of different types of fish and aquatic creatures. And, fortunately, you don’t have to go all the way to Australia just to visit them! The southern coast of Florida is home to North America’s only living coral reef! The reef stretches for 221 miles, starting up by Miami at the Key Biscayne and following the Keys all the way down to Dry Tortuga. Now, you probably won’t be able to get to all 221 miles in a day, but kayak rentals can help you get an up-close reef experience worthy of the movies. Grab your snorkel gear and an underwater camera to make the day of it, or spend some time at the reefs before heading inland for some totally different kayaking trails. If you’re feeling particularly adventurous, ask about multi-day kayak rentals and take a trip along as many of the Keys as you can! If you’re interested in heading a bit closer to the main peninsula, you can kayak into a totally different sort of landscape. Many of the inland waterways around Key Largo are lined with mangroves, which make it feel as if you’ve been transported to another world. It’s a quiet, peaceful landscape, but no less magical than the reefs. Paddle up mangrove tunnels that are so serene you can scoop up handfuls of little fish. When you need to take a break from paddling, dangle your feet in the water and relax to the bird calls chirping through the trees. Many of the mangrove tunnels are too narrow or shallow for boats to come through, so this is an excellent option for kayakers who want to get away from motorized watercraft. When most out of town visitors to Key Largo think of state parks, they picture mountain ranges or thick expanses of forest. As you probably imagine, that’s not so much the case in South Florida. 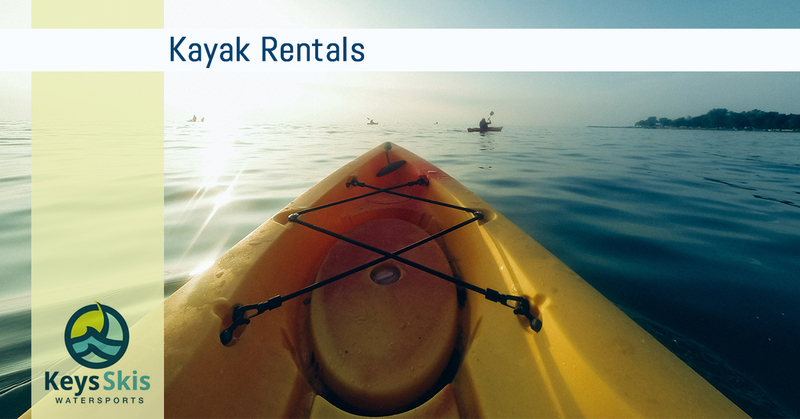 Whether you’re interested in exploring the mangroves, the reefs, or the Everglades, the kayak rentals team here at Keys Skis and Adventures can direct you to the nearby state parks or other great paths to take by kayak. Not only can a kayak take you down watery pathways you can’t on a jet ski, it’s also a great option for those who want more active outdoor activities. Kayaking is easy enough that most people are capable of steering and propelling their craft without much training. At the end of your day’s adventures, you’ll definitely feel the positive impact of the work you put in! Fortunately, there aren’t many safety measures you need to know for kayaking. We can provide you with life jackets, if needed. We’ll also guide you through the basics of rowing and how to steer, but it doesn’t get much more complex than that. If you have any questions about the safety side of kayaking, give us a call and our team can fill you in. However, there’s no real cause for concern. Kayaking is a family-friendly water activity for a reason! Explore Key Largo and the surrounding waterways at your own pace and enjoy the abundant beauty this part of the world has to offer. Contact the Keys Skis and Adventure team to learn more, plan your trip, and reserve your kayaks today!